Assorted Nr. 31: MakSS Damage Hip-Hop Nazi, Solidarity with Thessaloniki 4 and A. Paredes, Revolt in Egypt, Fight Back Vol. 4, etc. This comrade, accused of murder because of defending his life against a fascist attack and currently in prison, recently had a court date, the result of which is still unknown to us. We wish him all the best. You can read a thorough article, in German, about his situation by clicking on the image above. While on the subject of Greece, there is a loooooooong serious of developments taking place there regarding the anarchist movement. Some of them very inspiring, others worrying, but certainly worth taking a longer look at, and drawing one or another lesson from. Sadly, time constraints keep making us postpone a more serious post on the subject. *This very likely spectacular party (:-)) is also behind us, and it included a Fire and Flames tombola, so we assume it as a smashing success and quite a few people left it very happy! *The last few weeks in the local village life have also not been without the one or another noteworthy happening. For example that on the day of the Liebig 14 eviction, there was also a spontaneous demonstration in Göttingen. Despite a massive police presence in the city, clearly with the aim of preventing a situation like the one the week before, approximately 100 people managed to take part in an unauthorized demonstration, which even included some property damage. Although a remaining approximately 40 people were boxed in by police towards the end, the evening ended with neither arrests nor identity controls. *The revolt in Egypt is of course common knowledge, but we would like to suggest the following interview, portraying the perspective of anarchists present in Cairo, organized in the Black Flag anarchist group. *Speaking of cops, demonstrations, revolt and things of the sort… This is already a few months old but how can it not be mentioned here? 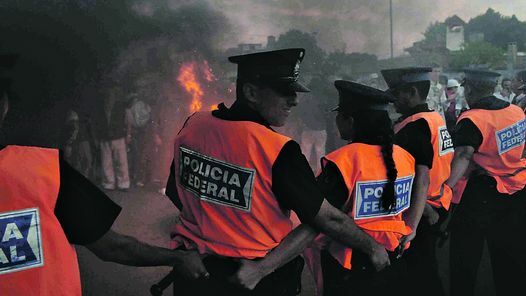 The Argentine government recently forbid Buenos Aires city cops from taking firearms of any kind when working at demonstrations. This means not just no guns, but also no rubber bullets, and no tear gas launchers!!! We wish the cops the best of luck with holding hands against social anger and unrest! As unpleasant as this all is, similarly unpleasant is the string of antideutsch geniuses who now are of the opinion that they have found final proof of the „parallels“ and „compatibility“ between left wing anti-imperialist politics and modern Nazis. Here is a tip for you: Extremismustheorie. *Since we are vaguely on the subject of music, here is a little something from the Fire and Flames world, a small clip from Obrint Pass recent Japan tour. (Btw…if you happen to be in Tokyo and are wondering where you might find some quality Fire and Flames items…we suggest Irregular Rhythm Asylum Infoshop or Cafe Lavanderia ). Du browst gerade in den Fire and Flames Weblog-Archiven nach dem Monat Februar 2011.